Let’s face it, our area is inherently challenging to gardeners. We have continentality which causes extreme variations in temperature and moisture, and we are in an area of the continent that is a transition zone for East, West, North and South. It’s difficult to keep all parts of our gardens looking good at the same time. With the recent dry spell we just had, many of us have spots in our gardens that look a little burned out. I have a lot of native plants which love our conditions, but even some of those look ragged and dried up in late summer. 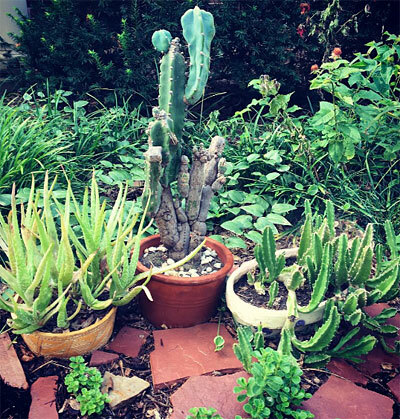 The cactus in the middle is my oldest one – I’ve had it since I was five years old! When choosing containers, first keep in mind what style of garden you have. You can break design “rules” but you will have more predictable success if you try to match the style of pots to the style of home and garden you have. We have a client with a large Colonial Revival house and a lot of iron fencing and furniture in the backyard. 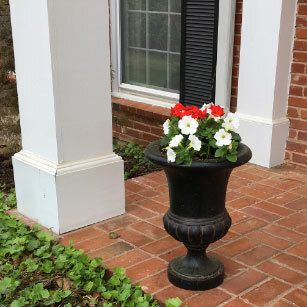 When adding some container plantings we chose symmetrical numbers of faux cast iron urn style planters that harmonized with the existing architecture and garden. We filled them with traditional flowers in a limited color palette that went well with what was already planted in the yard and garden. The look we chose for that client would not be appropriate in my garden. My own informal garden contains a lot of wildflowers and herbs mixed with ornamentals that grow in shade. 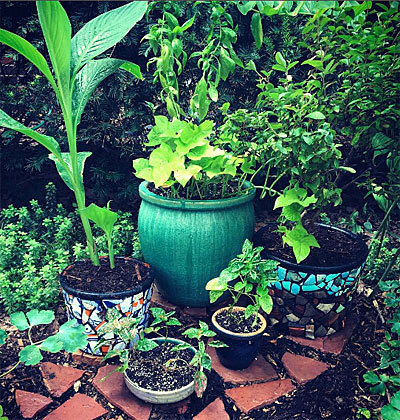 Mixing and matching pots and using odd numbers of containers are design techniques that work well with an informal garden. To prepare a place to set the pots, I gathered up an assortment of flat decorative sandstone pieces and made little stands for the pots. You can set pots right on the ground, but I think they look better raised a little bit. I used some extra thin pieces of rock as shims for any pots that did not look level. Starting a new container grouping in a bare spot. Finished container group with foliage plants. Two of the pots you see here already had plants in them. Keeping in mind the colors, shapes and sizes of the other three pots I wanted to add to the grouping, I went plant shopping for part shade annuals. I chose Sweet Potato Vine, Ornamental Pepper ‘Black Pearl’, and Hypoestes. I couldn’t resist adding a Basil plant that was on sale. 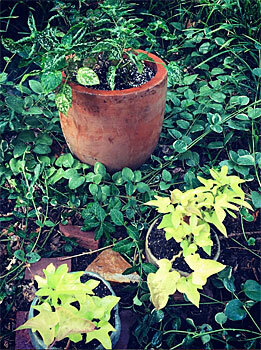 In large pots a good design formula is to mix tall, shorter, and trailing plants. In the largest pot I made the Basil the tall plant. I just love the smell of Basil and I’ll harvest it just before frost and cook with it. I know it’s a little late in the season to be planting annuals but these should last into October. If we’re lucky and we get an extra long growing season, maybe I’ll get more out of them. Containers small enough to move can be brought inside to avoid frosty nights and extend the life of the plants. I love the colors of the garden with bright fall leaves nestled among the plants so to me the extra effort of adding some more colorful foliage is worth it. I chose all foliage plants instead of flowering plants because two of my containers featured a mosaic design that I did and they were already very colorful on their own. As you can see, container gardening is a great addition to your existing garden. It provides a fun outlet for creativity and some instant gratification too! One of my frequent landscaping tasks in summer is weeding at clients’ properties. Many of the weeds can be hand-pulled, but on a recent occasion there was such an abundance of Prostrate Spurge (Euphorbia maculata) that it was hopeless to try to pull it in a reasonable amount of time. After consulting with my colleague, we decided to turn over the soil in the badly infested spots with a spade and bury the spurge rather than try to hand pull it. 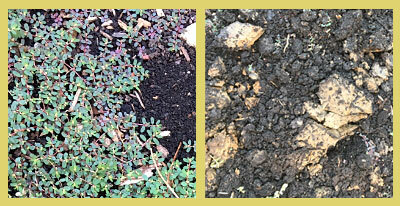 At the left is a spurge-infested patch, and on the right is how it looks after the soil is turned over with a spade. 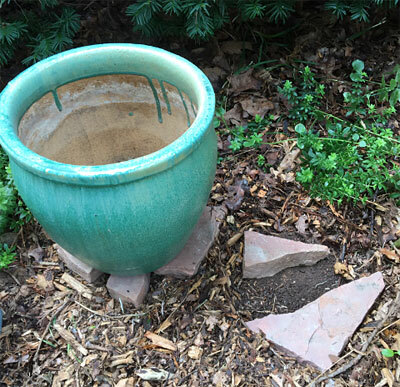 Since we are not going to plant anything here, we don’t need to take the time to break up the clay chunks – nature will do the job over time. Weeds often are able to reach down with taproots and pull nutrients out of hard-packed soil and clay that other plants can’t reach. You can see from the photo above that there is only a thin layer of good soil here with clay underneath. By burying the weeds and letting them decompose, we are returning the nutrients to the soil rather than removing them and discarding them. Prostrate Spurge likes compacted soils and by making the soil less compacted we are making it less hospitable to future Spurge. The area in question is in a restaurant drive-thru so among the weeds were an abundance of cigarette butts thrown from cars. It sure takes less time to bury the butts than pick them all up! Bare soil exposed without mulch or existing vegetation is an invitation to weeds so this area needs to be mulched right away. Since the old mulch in this bed was about gone, it was due for a fresh application anyway. Turning over the soil exposes possibly buried weed seeds to sunlight and may make them sprout when they otherwise would have lain dormant. Some weed seeds remain viable for up to 100 years! Quick action needs to be taken to prevent a fresh infestation. We are planning a three inch application of mulch in this bed to suppress and slow down weeds. The mulch will also keep the soil more workable and make it easier to pull future weeds. We don’t think the mulch alone will be enough to control the weeds to the extent we’d like. In addition to the mulch, we are going to conduct a test of two different preventative measures to see which is most effective and long-lasting. In one half of the bed, we are going to apply a pre-emergent herbicide. On the other half, we are going to put down a layer of cardboard under the mulch to smother any weeds I may have missed plus future weeds that might sprout. The cardboard blocks light getting to the weed seeds. It eventually breaks down and feeds the soil but buys you quite a bit of time – several months to year. Using the cardboard or other layers of organic matter is called “Lasagna Gardening” or “Sheet Composting” and I use it extensively with good results in my own garden. It wouldn’t be practical to try in every circumstance but our test will show whether or not it works well enough to use in some commercial situations. Stay tuned for updates on what happens! When a bar of soap gets worn down and is near the end of its usefulness, it’s considerably less appealing than when it was new. The scent has faded, it’s brittle or soggy – time to throw it out, right? Do you have some soap bars you don’t like? Do you have a collection of little motel soaps that you don’t know what to do with? You could throw these soaps out, but I prefer to save up my soap scraps and make them into laundry soap. It’s fun to do and probably uses supplies and equipment that you already have on hand or can obtain for little cost. 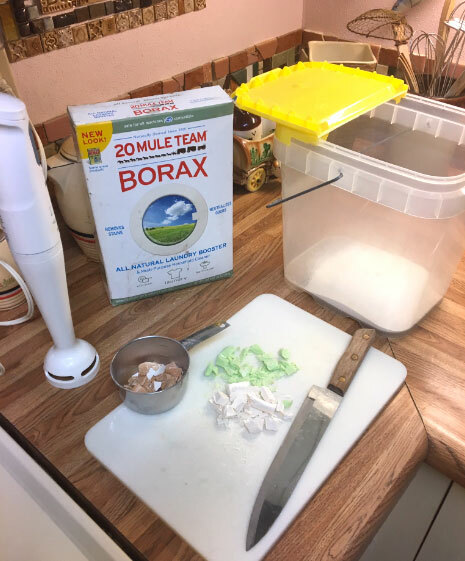 Put one cup dry Borax into the bucket. Cut up soaps and add 2 cups soap pieces to the bucket. Blend all well with the stick blender. If you have more soap pieces and room in the bucket, add more ingredients in the same proportions until your bucket is about 2/3 full. After blending well, let the mixture sit for awhile and see if the liquid thickens. If so add more water until it’s roughly the consistency of liquid laundry detergent. Use 1 cup of the new mixture per load of laundry.